New England's Premier Adaptive Dealer. Am I ready for a wheelchair van? Their mechanical hand controls provide safe, easy and more convenient vehicle operation as well as being priced competitively with other manufacturers. They manufacture 4 different types of mechanical controls to suit all needs. Wells-Engberg controls come with a universal mounting, using a common set of connectors which allows installation in the majority of domestic and foreign cars, light trucks, and vans equipped with automatic transmission and power brakes. They also have designed special mountings for some vehicles which make installation even easier. Their two cable controls are supplied with a mounting which allows the cable to be run directly to the accelerator pedal itself. Wells-Engberg is constantly striving to keep up with the automobile manufacturers and supply the physically challenged population with the most advanced products available. •Mechanical control with a flexible accelerator cable going directly to the accelerator pedal assembly twist handle (same as motorcycle grip) to accelerate. •Push handle toward brake pedal for braking. •Control is mostly aluminum and is black anodized. •Order either right or left hand. •The cable design allows reduced amount of hardware in driver’s area. This gives the driver more leg room. 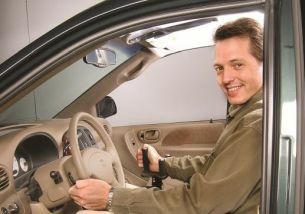 •To operate accelerator pull handle down toward lap. •Cable attached to handle goes directly to the accelerator pedal assembly. •Control made mostly of aluminum and is black anodized. •Cable design reduces hardware in the driver’s area allowing more leg room. The rods are attached to both the brake and accelerator pedals. In order to operate gas pedal you rotate the handle (same as a motorcycle grip). To use the brake you push the handle toward the brake pedal. This Hand Control is made of steel and is painted black. The MC-25 uses universal mounting brackets. There is very little interference with able bodied drivers. It can be installed on the right or left hand side. This control is operated utilizing air pressure in its own self-contained unit. The pneumatic control operates the brake and accelerator using a push-pull joystick with very little operating effort and a short stroke. These controls have been in the field since 1982 and have proven to be very reliable and, with proper maintenance, trouble free. Call (508) 697-6006 for sales or call (508-697-8324 for 24 hour service.